Special Visitor at Kenny’s Pond! We had a special visitor at Kenny’s Pond on Easter Sunday. The one and only Easter Bunny paid us a visit! 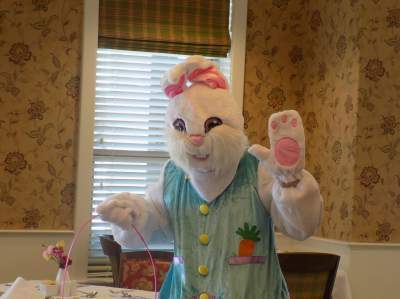 He hopped his way around the building providing Easter treats and friendly visits for all. Happy Easter everyone! I was a teacher, and I’ve traveled a lot, and I’ve never met anyone like the people who work here. They are there for you at any hour of the day or night. In its way, this place is more spiritual than the Vatican — the people really live the message of caring. The building is wonderful, everything is wonderful. It’s next to heaven.